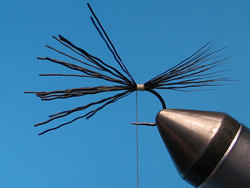 Moose-hair and deer-hair tails are associated with fast water patterns where more floatation is required to avoid the fly becoming quickly swamped. 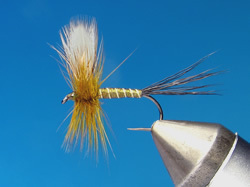 Their length is a little shorter than a traditional hackle tail. I’d suggest 6/0 tying thread is about right for their dressing, though you might prefer 3/0. Look for fine straight hair. 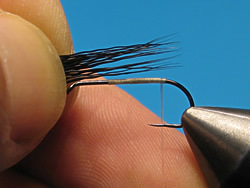 If you can’t stipulate to your supplier the exact hair you require, like for instance, deer-hair from the centre of the animals back, or moose-hair from the animal’s neck, then ask for hair suitable for tying tails on coachman and wulff patterns, and wings on comparaduns and caddis patterns. 1. 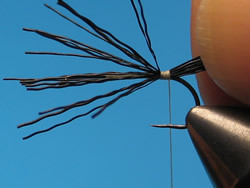 Start the tying thread and make touching spiral wraps stopping just before the bend. 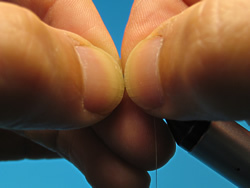 Then take the thread back toward the eye by three or four touching wraps. 2. Cut, de-fuzz, and stack a small amount of hair. Then measure for length. 3. 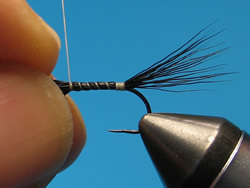 When you’re happy with the length, swap the tailing material into your opposite hand ready for tying in. Pinch the hair, putting thumb tip to thumb tip. 4. 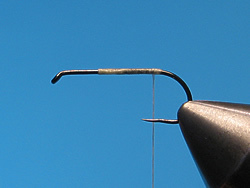 Now place the hair on the near side of the hook and angle down at approximately 45 degrees and make one wrap of thread loosely around it. 5. Pull the thread down firmly and make a second and third wrap to secure the hair. Do not release your grip on the tail ends. The butts of hair will flair but you’ll gather those in a few moments. 6. 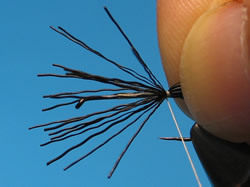 Now make less firm ‘gathering’ wraps of thread over and behind the securing warps, before returning the thread to the front of the securing thread wraps. 7. 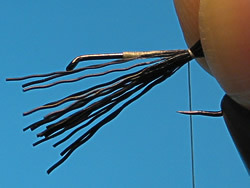 You can now release your grip on the tail which should be only slightly flared. 9. At this point you can either double the hair back for increased volume and bouancy or you can cut away the waste material. 10. 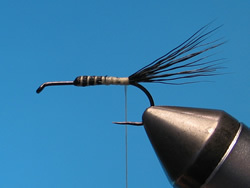 Here moose is used in a green drake pattern.